What’s It Like To Start A Music Festival? There are few summertime activities more sublime than the outdoor concert; sitting on a blanket on the grass or dancing (or moshing) away in front of the stage, and enjoying the sky, sun (or moon) above you. For those of us who live in the cold weather parts of this country, those precious few months where it’s sane to be outside for long stretches of time and the chance to hear some of your favorite music all in one place is a dream come true. The River Rock Festival in northern Maine (just over two hours from my home in New Hampshire) is in its first year, and I wanted to take the opportunity to ask festival founder (and the head honcho of The Lighthouse Christian Events), Jeff Wall, about what goes into starting an undertaking of this sort. He generously put aside the last-minute minutia of planning and spoke to me for a few minutes on the phone. (Jesusfreakhideout’s Alex Caldwell): With just over a week and a half to go till the crowds arrive for River Rock, how’s it going? Jeff Wall: (Laughing) I’m doing alright. Thanks for asking. Most of the details and major components of the festival are in motion, so it’s a bit out of my hands at this point. I’m coordinating volunteers for the festival right now, that’s my focus. AC: Volunteers…that’s an important component to these sorts of undertakings, isn’t it? Jeff: Oh, yeah. It’s critical. Right now we have enough to staff the festival, but I’m not sure how much sleep everyone would get. Festivals and concerts need volunteers. It helps everything run smooth. AC: You run the Lighthouse Christian Events, how is this different than that, and how long have you been in this line of work? Jeff: We started in 2008 with a concert by Laura Story, and we’ve been going strong since then. Really, putting on a festival is something we’ve always wanted to do, and it’s a natural extension of what we’ve been doing. But it is a lot more of everything. AC: How much more? How are you sleeping lately? Jeff: (Laughing) I haven’t really slept in seven years. I’m always waking up thinking about things. But I love it. AC: So, here’s a bit more of a challenging question. What will distinguish River Rock from the myriad of other festivals out there? What would be the reason to choose this one over the other ones around? Jeff: That’s the question, isn’t it? I think the great distinction would be quality--getting the most bang for your buck. It’s very common, in all corners of the concert industry, to charge for everything: parking, surcharges for ticket, special “autograph” fees etc. You can go in thinking that you’re going to be spending “X” amount and realize, after the fest or event is over that, really, you’ve spent almost double what you had wanted to. We’ve always charged one flat fee for our concerts, everything included, if it’s within our power to do so. AC: “I have a story about that. A few years ago my family was at a fest, and my daughter and I stood in line to meet an artist she loved. I was a little out of it due to sun and loud music, so I didn’t read the fine print of all the signs around the signing tent. When we got to the front of the line we discovered that there was a $30 signing fee that we had to pay. My daughter was upset, and I was frustrated. $30 for what most of the other artists were doing for free. It was too much and seemed greedy. Jeff: That’s right. We don’t take any percentage of artist merchandise sales either. That’s a pretty common one. AC: Yeah, what if you are a smaller artist and just starting out? Those t-shirt sales become pretty important for getting back home in the van. Jeff: That’s exactly right. We made a commitment not to do these sorts of things when we started out, and so far, the Lord has honored that decision. AC: Are you and your family taking a big vacation after this event? Jeff: It’s interesting that you say that. We all enjoy this so much that we don’t really need the standard vacation thing. Right now we’re on the road, coming back from a Kari Jobe concert we put on, and we’re heading to the Norman Rockwell museum along the way. This job is crazy on one level; the details, the schedules etc. But my family gets to see so many places; we like to treat those times as a vacation. AC: Well, God bless you guys as you head into the last few days before the festival. Jeff: Thanks so much. We’ll be seeing you soon. Aaron Watkins grew up despising what he ended up loving - music. Wyoming born and Colorado raised, Aaron has seen and survived a lot of things. His father was an alcoholic who played in some fairly well known bands, and he did not want that lifestyle for himself. He toured with some bands right out of high school and escaped the music scene in his mid-twenties when he finished up his bachelor's degree. He then said, "God, I'll do whatever you want me to do." God wanted Aaron to do what he hated in his childhood - perform music. 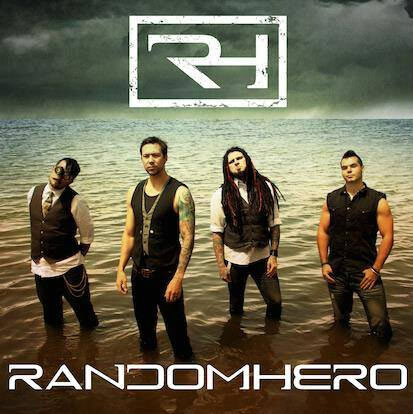 Random Hero was formed by guitarist Joshua Bertrand the year prior. Aaron's manager told Aaron about the audition they were holding for a singer. Aaron auditioned and was awarded the slot, forming the nucleus of Random Hero. God changed his heart and gave Aaron the desire to be in music and the desire to tour. God also gave Random Hero the revolving door of drummers. Aaron quipped that "We fight to do this because this is what God's called us to be. The timeline has been crazy, so you know when God is leading someone in or out. He takes people in and out until we have the right mix." Four drummers in eight years is definitely an uphill battle. For a while, the services of Air Force serviceman Josh Tarrant were utilized. It got to a point where it was impossible to balance the two and he left. Then the band found Patrick Madsen in 2014, and Aaron raved about him. "He has the greatest heart and is a phenomenal drummer. I always wanted to be a drummer so it is so much fun to watch him play." Ironically, drums are the one instrument Aaron can't play. His toddler son (Huxley) can play the drums, which you can watch on his Instagram @aaronthewatkins. I also asked Aaron what goes into the recording process, what is 'mastering' and 'mixing'. His combined thoughts: "You are always constantly writing, and it may or may not see the light of day. We have written hundreds of songs. You set a date to record and twelve to fifteen songs make the chopping block. The songs need to be the best representation of who you are, and they need to be the best songs. The producer will likely make you rewrite half of the songs, which is painstaking and time consuming. Everything from vocals to guitars to drums to the special instrument is recorded separately so each thing can be edited. If one part needs to be reworked, the whole band doesn't have to play the part fifty times. Mixing is what your songs sound like and are built." How loud are the vocals compared to the guitar, bass, drums, and so on? "Mastering is when you take the volume up several notches so it sounds 'beastlier'. The worst part of making a record is waiting for it to be finished. You are always learning and evolving like we did from Carry Me, Bury Me to Oceans of Change and we will in the future." Making an album is not an easy endeavor, and being in a band involves great dedication. When a band 'trains' a new musician, it isn't just "teach them the hits and go on the road." The prospect has to have the drive and the will necessary to be in the band and to learn the songs. They have to be willing to come to practice and to receive constructive criticism. They have to learn every song in the repertoire to be ready at any point. It isn't a mechanical 'this is the exact way you play it' with no deviations, but there are the main parts to every song you have to have down. There is room for improvisation and personalization occasionally. We started practicing two times a week, and to be a new band you have to practice a ton to be your best. Now we practice two times before leaving on tour because it is all muscle memory at this point. Speaking of touring, Random Hero is touring with good friends Spoken this June. Random Hero was (and is) under the tutelage of former longtime Skillet guitarist Ben Kasica. Ben taught the band how to be marketable, and to blend Aaron's pop influences with Josh's progressive metal influences. Random Hero strives to be themselves while maintaining the marketability, and they don't want to restrict themselves to the metal market. Everybody in the band needs to like the songs and to have input in the process, but you won't find Random Hero writing a six minute song. Aaron finds that after three minutes people zone out and are ready to go to the next idea, so they strive to create an album with twelve radio hits. Keeping this in mind, Random Hero changes the set list nightly. The radio songs are always on the list, and fan favorites are usually on the list. The set list is dynamic, yet some songs may be played rarely or occasionally. A typical show lasts thirty to forty five minutes; with material from the Breakdown EP, Carry Me Bury Me, and Oceans of Change. Random Hero doesn't hang out away from fans in a mysterious green room after their set. They often stay until the doors close while taking pictures, signing autographs, and hanging out. The band used to wear makeup and face paint on stage, but as they have matured they saw it as more of a nuisance and slowly stopped to have a more mature look. Some bands rarely produce EP's, but Random Hero embraces the EP. "An EP is an exciting taste of what is to come. For us, Breakdown set the tone for how we write as a cohesive unit. An EP is a good feeler to determine if the fans like a new evolution or not, and what to change for an LP." Random Hero left Red Cord Records and signed with Pando Records/Warner/ADA. The band will be back in the studio soon and will come out with a new EP later this year. Aaron Watkins also will be releasing a solo album on August 11th. Despite the business aspect of music and the unusual lifestyle, Random Hero's mission is to glorify God. These "musicianaries" strive to please God in every area (not just certain areas). God is the boss and Random Hero aims to be willing servants.